District Lodge 19 would like to spotlight Kenneth "Kenny" Krause. Brother Krause has been a member of Local Lodge 356 for 17 years and works as a Machinist for BNSF Railroad at the Argentine-Murray Diesel Shop in Kansas City, KS. During his time in the IAM, Kenny has served as third shift committeeman and is the current Local Chairman and Legislative Chairman. As Local Chairman, Brother Krause represents members on BNSF Railroad and Kansas & Oklahoma Railroad. 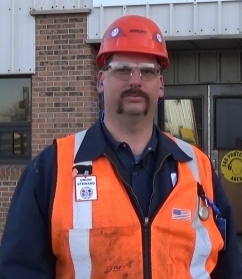 Kenny enjoys helping his fellow Machinists and is always there when they need him. “I have made being part of the union a way of life. That is how passionate I am about this great Union. Everything my family and I have is because of the IAM”, said Krause. Krause lives on a farm in Missouri with his wife Michele and his 16 year old daughter Liz. He is also has a stepson named Joe. Kenny’s hobbies include farming and camping. He also took second place in the 2015 BNSF barbeque contest. Brother Krause is a tremendous asset to both his Local Lodge and District 19. Other Local Chairmen should aspire to the level of commitment and dedication demonstrated by Krause. Thank you brother, for everything you do to help your members as well as your Local and District Lodges.